Title :SD Sengoku Busho Retsuden strategy guide book /NES Language : Japanese. This is an official book. Release Date : 1990 Total Pages : 62 pages Platform: Nintendo, NES Condition : USED. Good. No missing page. 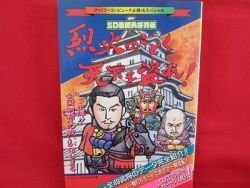 Description:This is a Japanese Videogame "SD Sengoku Busho Retsuden" Strategy GuideBook.This is a hard to find book! This book never be listed by other seller.